praices range from min for 2 persons in studio suite and for the larger suites for 2 couples and children 4-6 persons. Tuscany, a large region in central Italy is mostly known for its vast amount of monuments, breathtaking views and great works of art. There are lots of different ways, to spend a holiday in Tuscany; as a part of a group, where the guide leads you to all the major known events, but it can be much more satisfying to find your own way around and enjoy the culture of also the smaller centres, at your leisure. 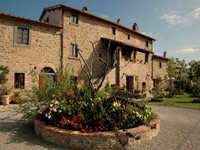 If you're not an Italian speaking tourist, it may look a little frightening , however if you're staying in the right accommodation , in a quiet, but central location , where the friendly owners are set to make you feel welcome ,and to make your holiday in Tuscany , the best you've ever had. 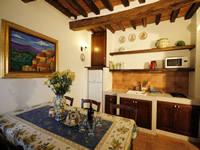 One of those accommodations in Cortona is "La Mucchia, Casa Vacanza", at the foot of the Cortonese hills. 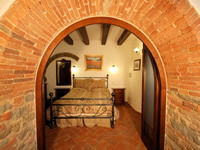 An old Tuscan farmhouse from 1760, renovated in the original Tuscan style, and divided in 8 beautiful holiday apartments, each autonomic with all modern comfort, like internet access, air-condition, satellite TV, DVD, equipped kitchens etc. On the surrounding grounds, there is parking space for all the guests, various terraces and a beautiful swimming pool with a surrounding terrace where you can enjoy lazy sunny days. Or you can take your car, and make day trips to a choice of directions, all at a distance from 5 till 80 km from home base, from Cortona itself to Firenze, Perugia, Montepulciano, Montalcino and Siena, or Assisi. The farmhouse, La Mucchia , is also ideal for a family holiday ,there is a small play ground, and of course the swimming pool , and the owners are always happy , to direct you to different centres of activities for children. Although Cortona is not a very big city, as a base for your Tuscan holiday, it can be perfect, because of its great location. So, if you are looking for a holiday rental for your family holidays in Tuscany, the vacation house "La Mucchia" should be a natural choice. 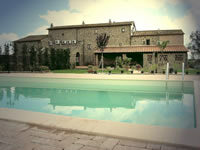 excellent for day trips because of vicinancy to the most important cities in Tuscany.